Hickman-Fulton County Riverport Facilities are located on approximately 10 acres of land and are capable of handling large volumes of products. A grain handling conveyor system is used to load grain from the storage & handling facility directly to barge. A general cargo conveyor system is used for offloading product to storage or to railcar. Warehousing at the Riverport consists of an 18,000 sq. ft. building used by a Port tenant and a 10,000 sq. ft. building that is connected to the general cargo dock via a conveyor system. 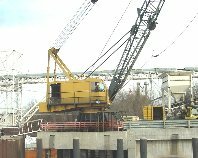 Our 9720 American Pedestal Crane with 125 ton capacity located at our multi-purpose general cargo dock in conjunction with a large staging area allows for the efficient and continual discharge and movement of numerous products. A fleet of fork lifts, front end loaders, trucks and trailers are available to assist with the high volume of products that are loaded/unloaded daily at the Riverport, allowing us to operate as a full service facility.